Retro Asylum – The UK’s Number 1 Retro Gaming Podcast Show! 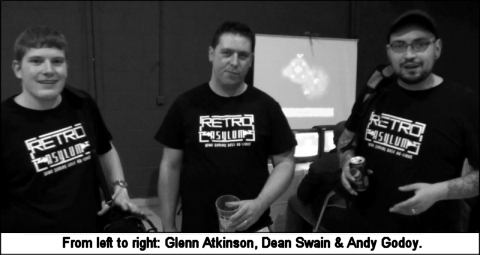 The Retro Asylum podcast show was launched in October of 2011 by Andy Godoy, Dean Swain & Glenn Atkinson after they had decided to bring their previous show (which had focused on all aspects of gaming) to a close. The new show would now focus on the guys main passion, namely the games that they had grown up with. Unlike other “retro” focused shows that were around at the time, Retro Asylum looked at the scene from a UK prospective. Whilst other shows talked nothing but Atari, Nintendo & SEGA, Retro Asylum discussed the systems the British audience had grown up such as the ZX Spectrum, Commodore 64 & Amstrad CPC as well as the consoles and looked at classic British games such as Manic Miner & Chuckie Egg. Within a few months of the show being launched it had shot into the top 20 of the iTunes gaming chart. Eventually Retro Asylum would manage to knock modern gaming podcast’s such as IGN, Giant Bomb & The Official PlayStation Podcast off of the top spot of the iTunes gaming chart and has now done so on numerous occasions. In 2015, Retro Asylum was voted “Best Video Game Podcast” in the very first UK Podcasters awards. In 2016, we won “The Worlds Best Podcast” award.